Jerry Yu, the president of the Saint John Chinese Cultural Association, says that support should also include better advice and guidance for entrepreneurs. Yu arrived in New Brunswick 10 years ago as a skilled worker in the technology sector. He came over with his wife who is now employed making sushi at a grocery store. And he says, they have two children, born in New Brunswick. He hopes they will stay. 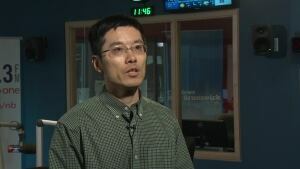 Yu says about half the Chinese immigrants that he meets in New Brunswick tend to leave for larger centres, including Toronto, Vancouver and Calgary. He says it's partly because they come up with unviable business plans conceived after short, exploratory visits to New Brunswick. "Before they come here they make a business plan, how they are going to invest here," says Yu. "But when they come here, they most likely realize it will be different than they thought." Yu says his association tries to help but they're just volunteers.